Clementine's having a nervous breakdown. The FAMILY MEETING! sign is up in her house, and she just knows she's in trouble for something. Has she been too mean to her little brother? Too sloppy? Eating too much junk food? Try as she might to find out what's on the agenda, her parents won't reveal anything before the meeting. As far as Clementine is concerned, the agenda should be something like: "We're getting a gorilla." But no, it's something entirely different. "We're talking about a new baby," says her father. "A brother or sister for you two. What do you think about that?" NO THANKS! is what Clementine thinks. After all, four is the perfect number for a family. There are four sides to a table, not five. Will Clementine learn to make room for one more? Readers will chuckle at Clementine's unique perspective on the age-old issue of sibling rivalry. Sara Pennypacker (www.sarapennypacker.com) is the author of four previous Clementine books and Sparrow Girl, illustrated by Yoko Tanaka. She divides her time between Texas and Massachusetts. 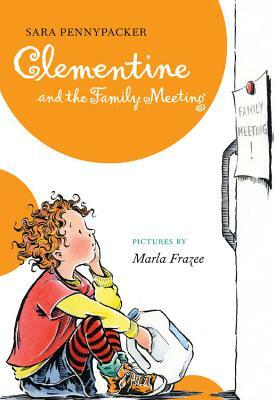 Marla Frazee (www.marlafrazee.com) has illustrated all of the Clementine books and many other beloved titles. She has been awarded a Caldecott Honor on two occasions, for All the World by Liz Garton Scanlon, and for A Couple of Boys Have the Best Week Ever, which she also wrote. She lives in Pasadena, California, where she works in a small backyard cabin under an avocado tree.